It was over 90 degrees at Gillette Stadium in Foxboro, Mass. on Wednesday, but the NHL hopes the weather will be drastically different there in just under six months. That’s when the Bruins and Canadiens plan to face off for the NHL Winter Classic on New Years’ Day at Gillette, the home of the New England Patriots. The game will be preceded by an alumni game on Dec. 31, and Wednesday marked the first kick-off event for both games. The press event was used partly to unveil logos for the upcoming Winter Classic, and both the Canadiens and Bruins went with throwback designs. The Bruins logo looks very similar to the design the team used in 1924-26, while the Canadiens’ offered a fresh take on the white "C" they wore from 1922-25. The Bruins and Canadiens are two of the Original Six teams in the NHL, and the upcoming Winter Classic will be the third between Original Six squads. 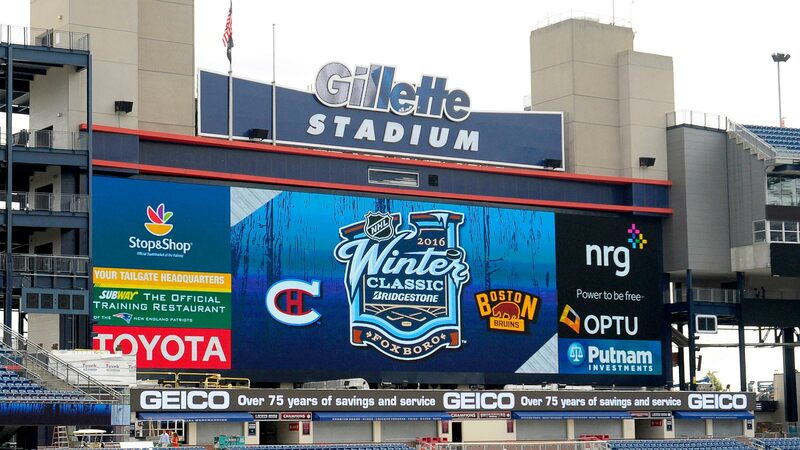 This is also the second time the Bruins have hosted a Winter Classic, as they played the Flyers at Fenway Park in 2010. But much has changed about the Bruins and the Canadiens since then, and one of the newest faces on the Bruins roster was on hand Wednesday to talk about the upcoming Winter Classic. Jimmy Hayes, a Boston native, was traded from Florida to the Bruins earlier this summer, and he said he is thrilled to have a chance to play hockey at a venue where he has attended concerts and Patriots games in the past. "It’s going to be a dream come true," Hayes said. The forward has played outdoors before, as his college team, Boston College, faced off against rival Boston University at Fenway Park in 2010 while the ice was still there from the 2010 NHL Winter Classic. "I remember it was really cold and it actually started snowing during our game," Hayes said. "That was a great experience and I was happy there were some heaters on the bench because I wasn’t sure how cold it was going to be trying to play without any of that." And while the NHL might be hoping for cooler than 90-degree temperatures, the league might want to be careful what it wishes for; Boston received an all-time high 110.6 inches of snow last winter — nearly triple its yearly snowfall average — and there were multiple occasions during which temperatures in the region plunged below zero. Hope they get those bench heaters ready.